Another family recipe, almost a staple food in my Mum’s house. 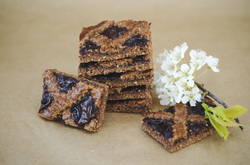 As its name implies, Linzertorte and it’s smaller sister Linzer Bar originated in Linz, Austria and was mentioned as early as 1700!! 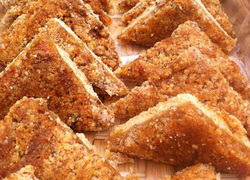 It has two delicious layers of rich and buttery, nut flavored pastry sandwiched together with preserves. While black currant preserves are the traditional filling, my Mum always uses raspberry jam and I stick to that. When you eat them you think you are in Italy. They are a small crunchy macaroon type biscuit with a fine note of bitter almond. 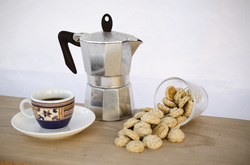 Ideal to go with a cup of Espresso or coffee or tea. Try them! 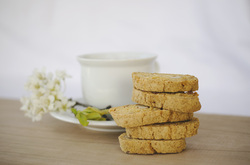 Biscotti originate from the province of Prato near Florence, Italy and are a double baked crunchy biscuit. People there like to dip them into Vin Santo, a very sweet desert wine. You will have to do it just before bed time or better on the edge of the bed, otherwise you might not make it into bed! But to assure you they are equally good dipped into coffee or tea. A German Bakery without the nut triangles? No way!!! They are a must. They even made it into the Guinness Book of Records. In Dec 2010 bakers from Koblenz, Germany, assembled the world largest Nut triangle measuring 5.6 x 5.7 x 9 meters and weighed 450 kg!!! My version, which I have from one of my uncles, is rather small in comparison but equally delicious. What would an Oktoberfest be without them? 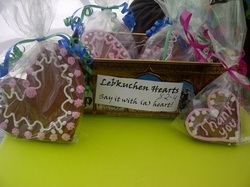 Of course you have to have a Lebkuchen Heart there! They come in all sorts of sizes with all sorts of messages, mostly for your sweetheart. Most people keep them and don’t eat them, but of course you can. They look pretty and taste nice!